Ernie got his first taste of motorsports at Pinecrest Speedway in 1957 while attending stock car races with his mother & step-father. 1959-64 Ernie raced at several tracks in Ontario. 1964 They moved to River Glade and built River Glade Speedway, they promoted it for 30 years. 1984 Ernie was named Canadian Promoter of the Year. Through the 30 years they promoted several other race tracks in NB and NS. They were instrumental in many of the class and rule changes. One of their biggest thrills was bringing Dale Earnhardt and Alan Kulwicki to race at River Glade Speedway. 2000 Ernie was inducted in the Canadian Motorsports Hall Of Fame. 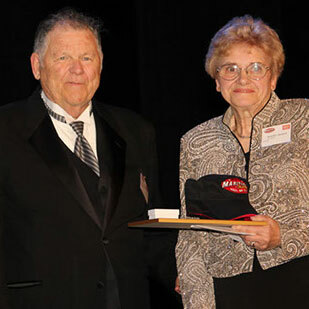 2004 they began working with the Maritime Stock Car Hall Of Fame, it later became known as the Maritime Motorsports Hall Of Fame Inc.
2012 Ernie is still President and Winona is Managing-Director.